This set of 13 very nicely detailed figures is from Nickelodeon's newest hit show Blaze and the Monster Machines. This creative show features the adventures of Blaze the fastest Monster Machine in Axel City and his driver AJ. Axel City is populated by large trucks called Monster Machines and Blaze is not only the fastest Monster Machine because of his turbo boost but the smartest as well! This figure set has all of the popular characters from this hit show including Blaze, AJ-his best friend, Gabby the mechanic, Crusher-Blazes biggest rival, Pickle, Darington, Starla in her cowboy hat, Stripes, Zeg the Dinosaur Truck and others! You also get a random 13th Blaze figure that may or may not be pictured for a total of 13 fun figures! These nicely detailed figures are self standing and are mini figures about an inch long. They have no moving parts including the wheels. AJ and Gabby are about 2 inches tall and each has comes on a flat base so you can display them almost anywhere.These nicely detailed figures are a great way to recreate this fun show! They are made of durable hard plastic. This set of 13 Blaze decorations not only look great on cakes but the kids will have a fun time playing with, collecting and trading these fun figures long after the party is over! These Blaze and the Monster Machines will help make any party a great success! Please note these are for adults and children 4 and older! Do not miss out on these great collectible Nickelodeon Blaze and the Monster Machines cake toppers/cupcake decorations! 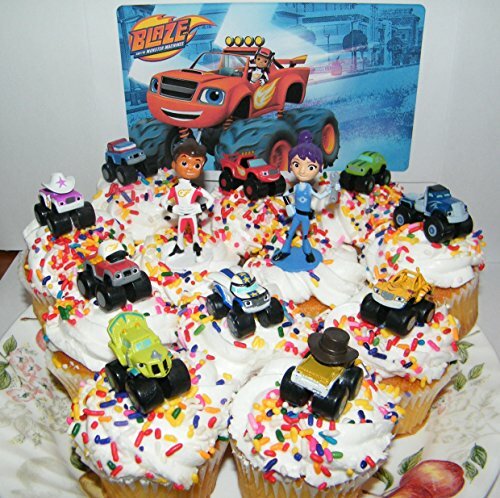 This listing is for 13 fun "Wheeling" Nickelodeon Blaze and the Monster Machines cake toppers party decorations! These are fun mini figures about an inch long and an inch tall except for JR and Gabby which are 2 inches tall. These work best on 12 inch cakes or on regular sized cupcakes. Please note these are bulk items that are shipped in plastic as pictured with no box. These are for children and aults 4 and older. If you have any questions about this product by Blaze and the Monster Machines, contact us by completing and submitting the form below. If you are looking for a specif part number, please include it with your message.